Can Stem Cell Therapy Help My RSD/CRPS? - Piedmont Physical Medicine & Rehabilitation, P.A. Can Stem Cell Therapy Help My RSD/CRPS? Reflex Sympathetic Dystrophy, or Chronic Regional Pain Syndrome, is a painful disorder that is a result of a malfunctioning nervous system. Particularly, the autonomic nervous system is affected. This is the portion of the nervous system that monitors injury sites, which is why RSD/CRPS tends to develop after a traumatic incident or injury. RSD/CRPS causes sufferers to experience hypersensitivity and increased pain in reaction to a stimulus, or sometimes no stimulus at all. RSD/CRPS is notoriously difficult to control and there are often no good alternatives, however, at Piedmont Physical Medicine and Rehabilitation, we offer several treatment approaches, some of which are new – Stem Cell Treatment for RSD/CRPS is one of them. For several years, we have been performing stem cell treatments with great success for those with musculoskeletal disorders, such as degenerative arthritis and soft tissue injury, and certain peripheral arterial related conditions. The idea behind stem cell therapy is to use pluripotent cells (capable of growing into new tissue) to heal and regenerate tissue at an affected area. Stem cells are capable of transforming into another type of cell with a specialized function. This makes them multi-functional for working in a variety of body locations. Stem cells are different than Platelet Rich Plasma (PRP) which is another regenerative medicine technique that contains active growth factors to help stimulate growth in tissue. PRP can behave like an activator to stem cells and “jump start” them or work all by itself to help concentrate your own growth factors at an injury site. Stem cells may be placental derived or harvested from your own adipose (fat) tissue or bone marrow. Once the cells are harvested, they are processed for use. Following FDA guidelines placental cells are typically isolated and frozen for later use. Adipose or bone marrow derived harvested stem cell have to be processed and isolated. Typically, they are placed in a centrifuge for concentration and separation. The concentrated cells are then reinjected or grafted back into the area of need – whether it is a joint, muscle, tendon or ligament. The intent is to induce tissue repair and ultimately to reduce pain or increase function. The treatment is fairly painless and is performed as an outpatient procedure with little downtime. For many, only one treatment is required, but further injections or complementary interventions intended to help achieve the best possible outcome may also be employed if necessary. How Does This Help My RSD/CRPS? A common result of RSD/CRPS is the restriction of blood flow in affected areas. RSD/CRPS most frequently occurs in the limbs. What sufferers notice is excessive pain, cold hypersensitivity, unusual sweating and changes in skin color. No one really knows why stem cells can help RSD/CRPS (or exactly what may help RSD/CRPS regardless of what is tried) but because stem cells have regenerative properties, they have the ability to increase blood flow to the afflicted tissue and to help heal the injury site at the same time. 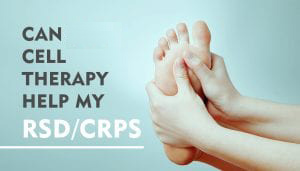 The intent is to relieve pain and to even try and help reverse many of the signs of RSD-CRPS. Although stem cell treatments don’t hold the cure to RSD/CRPS, they can provide a lot of relief for those suffering from the condition. Our goal is to find the right treatment plan for you. If you have not found relief for your RSD/CRPS symptoms, then we can devise a program that caters to your specific condition. Since we have many treatment options available we are able to work with you to find the right one that will most likely help you. We also don’t just rush into any particular treatment. Not only will we perform a thorough physical and history exam, we like to get to know you. While this can require a few visits, some diagnostic testing, and treatment to see what you may respond to, it will help us determine which treatment approach is best for you and to see if you are a candidate for stem cell treatment. Call us at 864-235-1834 or contact us here to schedule an appointment.